Mill-Max's BGA Socket/Adapter Systems are used for both socketing BGA devices and interconnecting circuit boards. Systems are available to fit 1mm, .050" and .8mm grid footprints. For socketing BGA devices, a socket is reflow soldered to the same footprint as the device using solder paste, and the balled device is soldered to a BGA adapter (pin header) with either flux or paste. The device may now be plugged into circuit. A simple pry-bar tool is available for removing the BGA and its adapter from the socket. For interconnect applications, a PCB adapter (pin header) is soldered to the surface of the daughter card, thereby making it pluggable into a mating socket surface soldered to the motherboard. 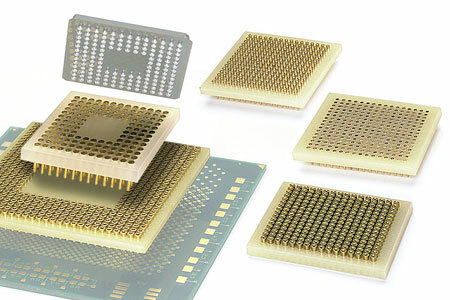 BGA socket/adapters provide a high density and low profile interconnect system. All pins and sockets utilized in Mill-Max BGA Systems are precision-machined brass and plated gold. Press-fit into every mating socket is a beryllium copper "three-finger" contact, also gold plated (heat-treated BeCu is the best spring material for electrical contacts). Mill-Max #04 contact with a .010" dia. mating pin is used for 1mm grid systems, #05 contact with a .018" dia. pin for .050" grid systems. A tapered "EZ-IN" pin is also available for .050" grid systems; it dramatically reduces the insertion force from .4N down to .08N per pin. This option is recommended for pin counts greater than 500. The insulator for the socket and both adapters is machined FR-4 glass epoxy laminate that has a TCE to match the BGA device and circuit board: .047" thick epoxy for 1mm grid systems, .062" thick for .050" grid. Mill-Max also offers the option of having the mounting surfaces of the socket or PCB adapter pre-tinned to replicate solder balls.